Well, has Spring arrived in your neck of the woods, or is Winter still hangin' on? even in the same day!! It's warm, then cold and rainy, and we woke up to ice... yes, you heard me right... ICE on the deck this morning!! The sunshine has arrived, and with that the promise of a warmer day, which we are all anxiously looking forward to. The card I have to share with you today is for my second day as Guest Blogger for Market Street Stamps Blog. If you're not familiar with them, (which I can't imagine) then drop by their online store, www.marketstreetstamps.com where you will find so many wonderful and very unique designs to make you one happy little paper crafter. 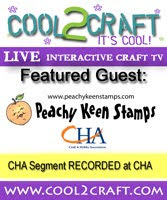 You'll see in the product description that the quality of these stamps is unsurpassed, as they are created with the same peachy tinted polymer as Peachy Keen Stamps, and it's the highest grade photopolymer that you will find used in this industry today. There simply is NO better quality to be found in clear stamps, and that's the fact, Jack!! LOL! I love Duck Dynasty! Can you tell? Seriously, though. Just try a comparison yourself, and you'll see just how beautifully they stamp compared to other clear, photopolymer stamps. Here's the card I created using the Berry Sweet and Doily stamp sets from Market Street Stamps. These are each SO economically priced at $5.00 and a must have for all your Summer projects and so much more!! I stamped the image with Memento Tuxedo Black Ink and colored with Copic markers. I stamped the doily on the four pieces of crumb cake card stock from Stampin' Up! with white craft ink from Stampin' Up! and then heat embossed them with white embossing powder. The banner was made with just a strip of white card stock, and by taking my 3/4" square punch and aligning a corner of it on one end of the strip and punching, you get a perfect flag edge. I then finished off the banner by framing it with a strip that was punched from a scalloped edge punch. The sentiment was stamped with Stampin' Up! cherry cobbler ink. I finished this charming little country card off with a bit of burlap ribbon and some flat backed pearl accents. It's sure been fun creating projects for Market Street Stamps this week. I hope you've enjoyed it as much as I have!! Happy stamping, friends and thanks for dropping by!!! This is so pretty, I just love strawberries and gingham check! Lorie, this is awesome ! I love strawberries and the doilies looks great. Fabulous card ! Love the lace background with the strawberry. So perfect!